L-Cysteine is used to regenerate or reduce oxidized L-Glutathione in the eye. Other nutrients were added to support the repair of the damaged lens tissues, etc. Information Provided By Advanced Scientific, LLC. � 2004 - 2010. Oclumed orders are limited to three bottles per order. Ingredients: Sterile Water, Sodium Hydrogen Carbonate (as a buffering agent), N-Acetyl-L-Carnosine, Purified L-Carnosine, Glutathione, Cysteine Ascorbate, L-Taurine, Riboflavin Monophosphate, Propylene Glycol (0.2%), Polysorbate 80 (0.2%). Please note: This is a commercial product manufactured for Advanced Scientific, LLC. This is not a compounded product. IMPORTANT: Please be aware that the formulation can sting/burn the eyes when putting the drops in. Due to the riboflavin the drops are a yellowish brown color that may stain light colored clothing/countertops, but will not stain the eye. Gently swirl the bottle each time before opening, and don�t put in contacts within 15 minutes of using the drops. 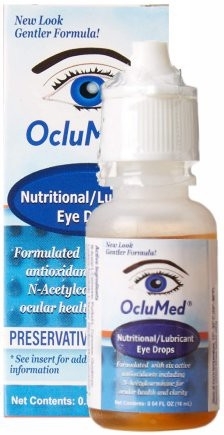 Availability: College Pharmacy is proud to be the sole distributor of OcluMed� Nutritional Eye Drops. OcluMed� is an over-the-counter product available by health professional recommendation. Stores at room temperature. Initial Clinical Trial Results Include: Nuclear Sclerosis: Improved visual acuity, Decreased lens opacity. Cortical Cataracts: Improved Visual Acuity, Decrease in cortical opacity. Nuclear Cortical Combined: Improved visual acuity, Decrease in lens opacity. Visit www.collegepharmacy.com to learn more about OcluMed� Nutritional Eye Drops. Information provided by Advanced Scientific, LLC.